I don't know where I came up with this image. But hey I had some fun, I just kept thinking of all the objects that could be wrapped up for presents and how we try to disguise what something is. 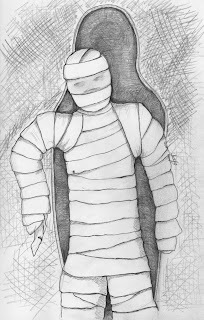 Then I thought about wrapping something so that you could see the outline and who should appear but the "mummy". Crisp and cool line work! tee hee this is brill hello one mummy from another mummy. This is great and I love the whimsy I feel from it. clever idea and so well done! Excellent work. And why didn't I think of the mummy. very nice illo and good interpretation of this topic..